What do you think of when you think of the South of France? Besides Cezanne and ratatouille and bouillabaisse and limestone villages with verges of broom along the roads? I always think of lavender……great fields of it…. With the air around it all perfumed. 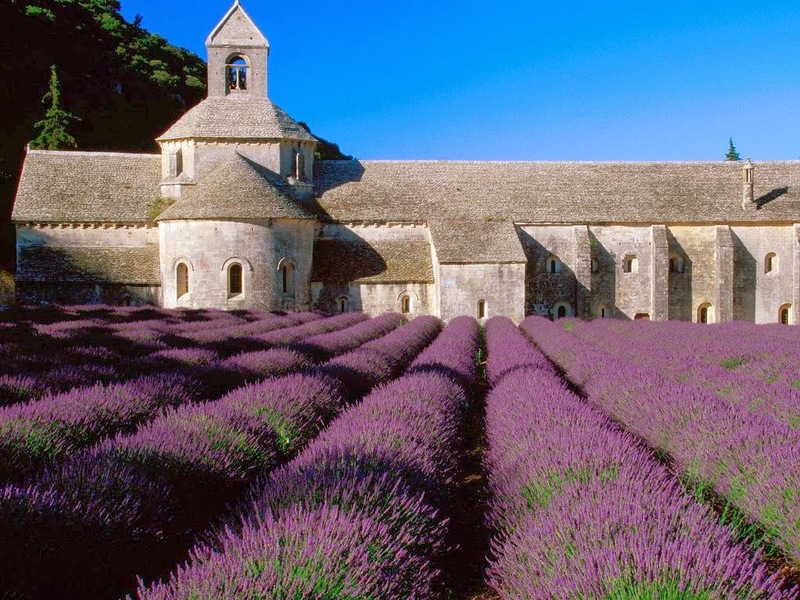 Whenever I smell lavender, it makes me remember France and how much I love it. I must be Nancy Mitford at heart. 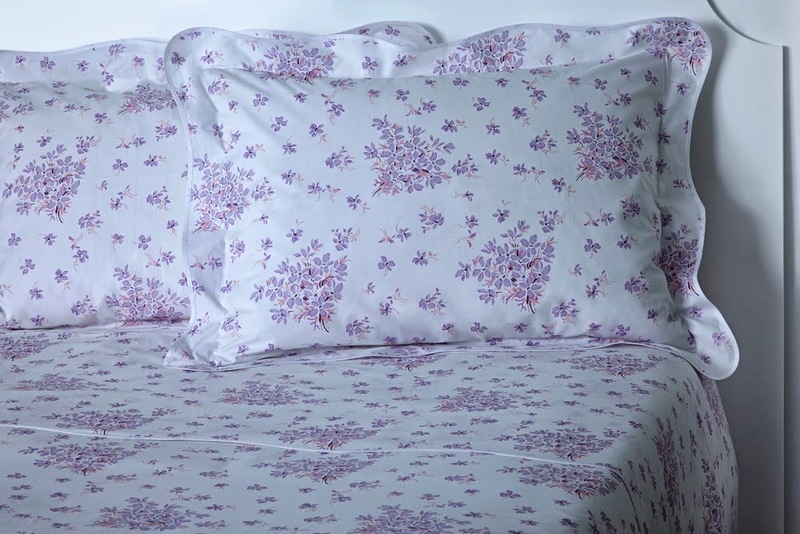 And thinking about lavender makes me think of the colour, lavender, that most quintessentially French of all colours. 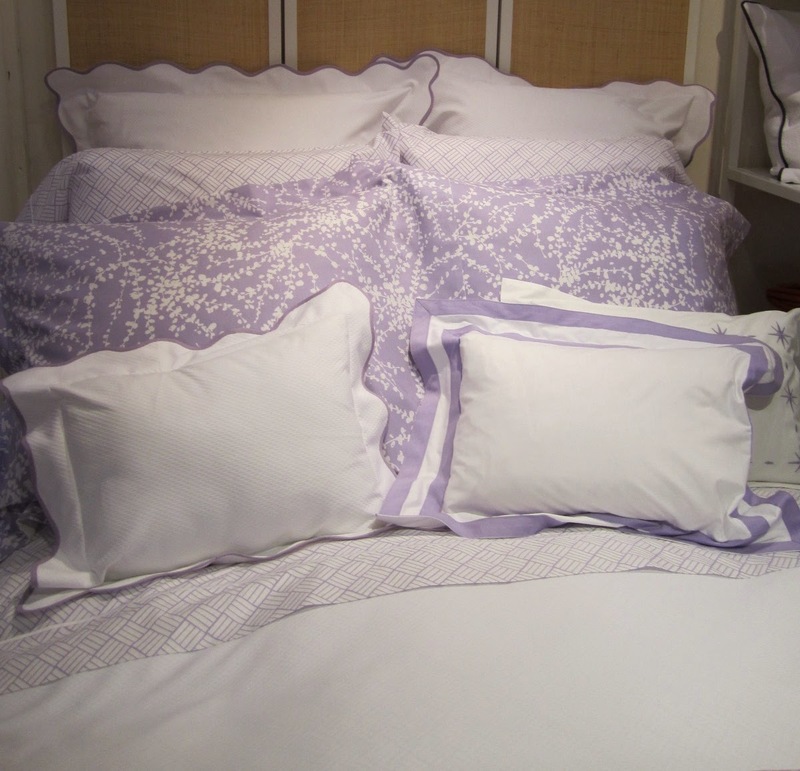 Lavender as walls…..
Everybody loves this room with its beautiful blue and white curtains and the lovely, airy bed hangings, but did you realize the walls are lavender? Yes. 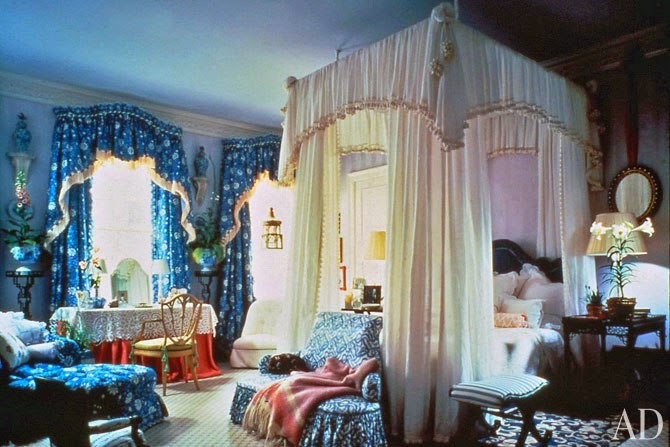 It’s the lavender walls that set off so wonderfully those same blue and white curtains. What genius! And so are the walls in the two rooms by Katie Ridder shown below. 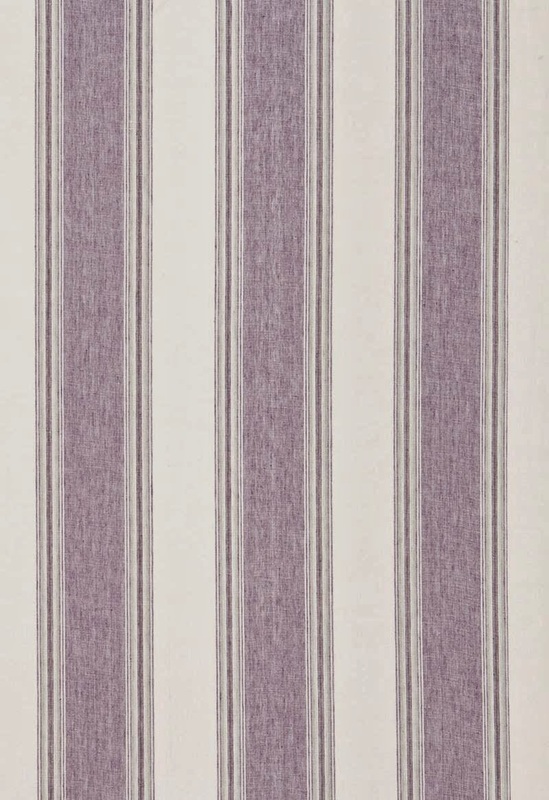 Those rooms above had painted walls, but what if the walls were hung in lavender and white striped paper? 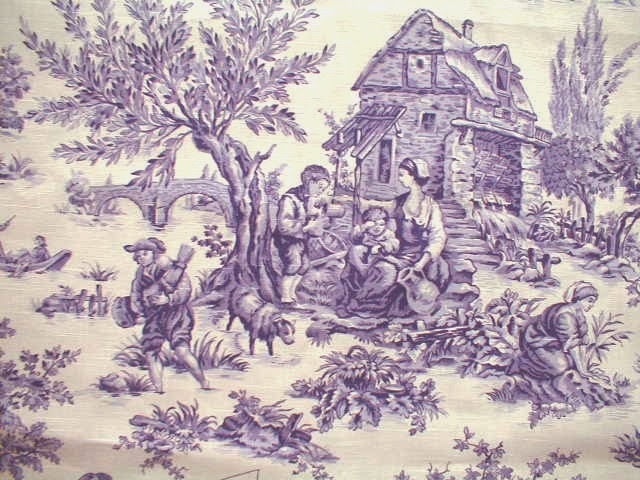 Or in a lavender toile? It’s such a versatile colour that you can use a little or a lot. 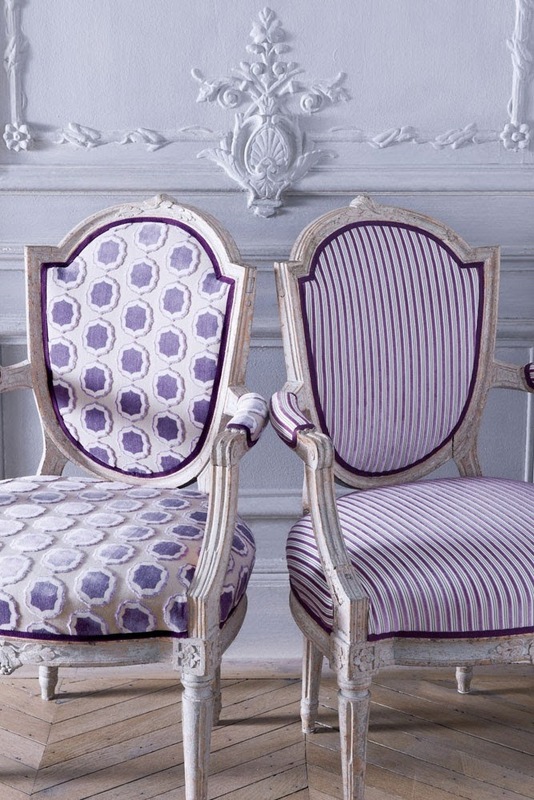 Those were rooms with a lot of lavender, but notice how the little bit of lavender in this whimsical pattern by Clarence House perks up the pillow on the almost white settee. 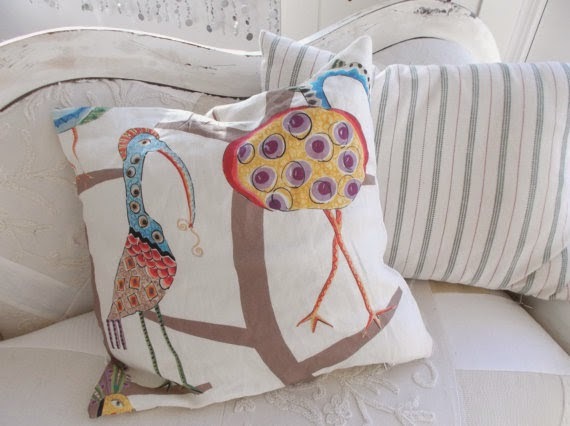 And if Porthault is too staggering for your budget, then look at these really nifty linens which Matouk has made in collaboration with Lulu D. K. (Lulu de Kwiakowski)—so chic and also available at my store. 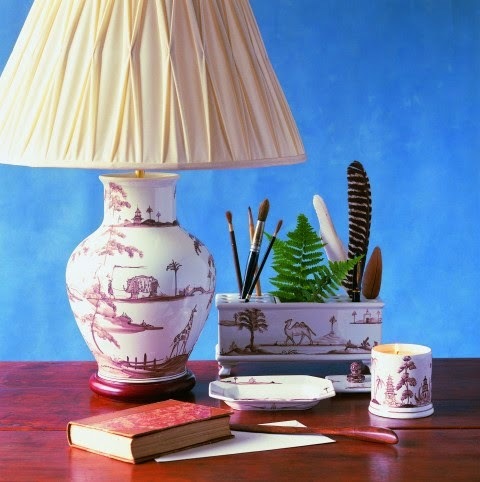 Or you could have a desk set including a wonderful lamp from one of our companies which I love the best, Isis Ceramics in Oxford, England. I love antique porcelain such as this dressing table set—an early 19th century English one—you could find beautiful ones like this at Sotheby’s or Christie’s, or if you don’t like auctions, go to James Robinson or Bardith in New York City. They have all sorts of beautiful antique porcelain in lavender. 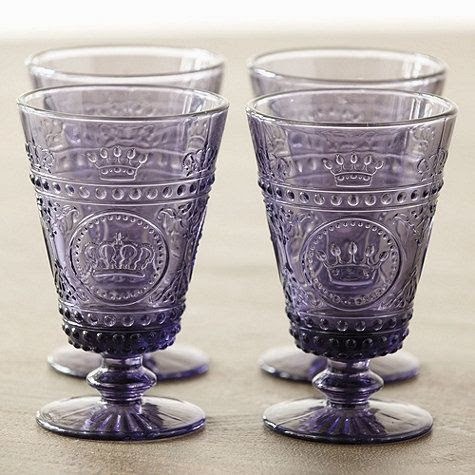 I love lavender glassware such as these “olde” French glasses from Ballard Designs. And I can’t help but love this little shield lamp shade from Abat Jour in New York (although I would not have used shiny passementerie on it). Put in a little dressing room with lavender and white shirting-stripe walls—over a lovely dressing table with a skirt of dotted swiss, I mean, how could you not? 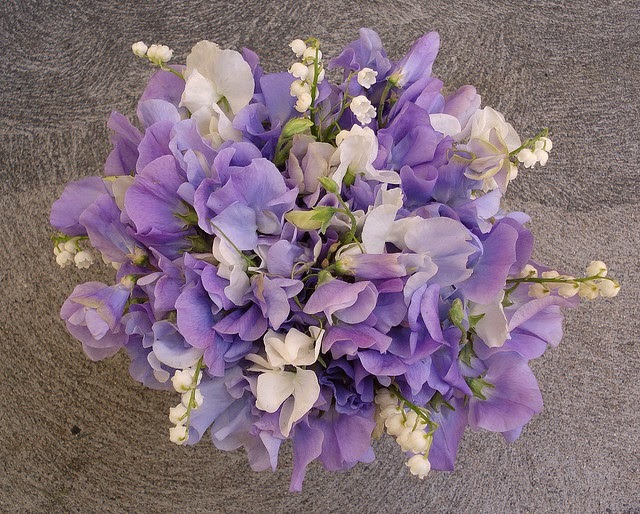 April is my birthday month, and its flower is a sweet pea—my favourite and the best smell. Long Live Lavender!! 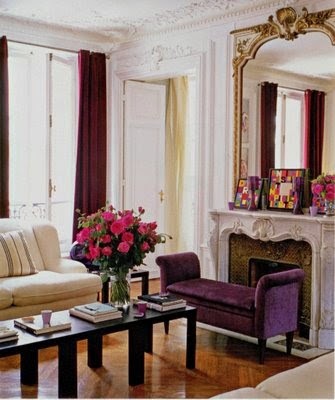 ceramics look great in this color and I didn't realize Mario Buatta's iconic room sported lavender walls. Thank you. LOVE lavender! Of course, all you say is spot on. Happy upcoming birthday too! 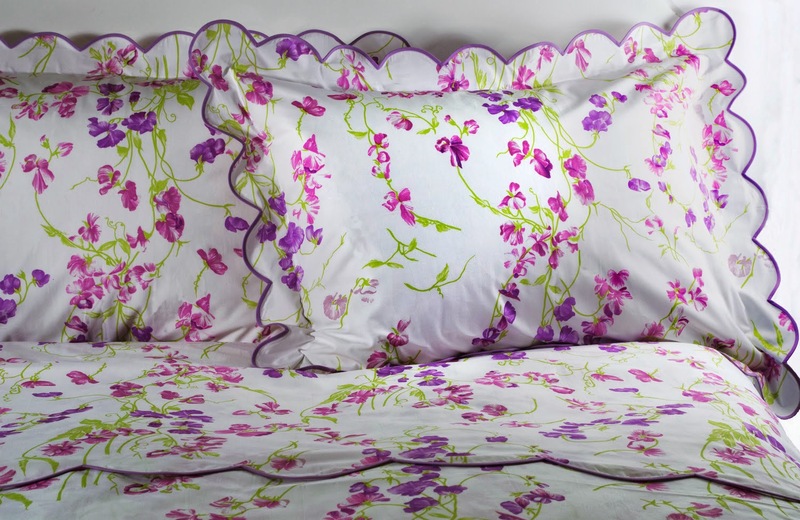 I died over the Porthault and LuLu DK for Matouk linens you have featured. Sublime!